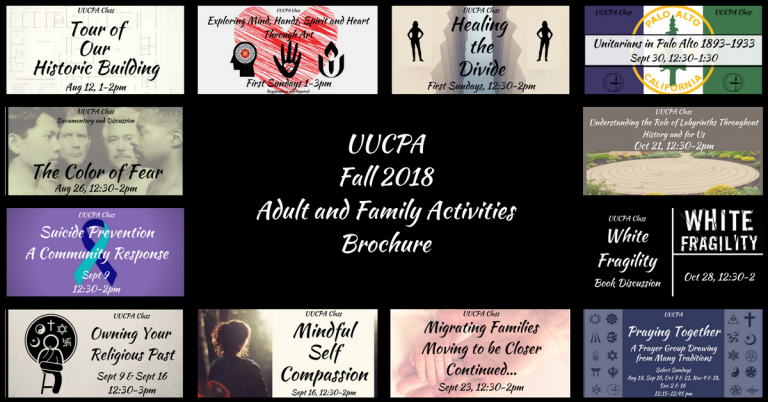 The Fall 2018 Adult and Family Activities Brochure is now available. Pick one up at church or here below. There are many exciting classes and even a new group or two, not to mention all of the usual ongoing groups including Adult Choir, Brown Bag Books, By Your Side Singers, Campus Workdays, Elder Journey, Faith In Action at UUCPA, Film Discussion Group, First-Sunday Sing Community Singing, Forum, Friends of Poetry, Harmonic Circle, Humanists @ UUCPA, Meditation, Men’s Groups, Monthly Writing Group, Sacred-Harp Singing, Second-Friday Bridge Club, Second-Sunday Lunch, Thespians, Women’s Groups, Xero Carbon, and Young Adult Group.